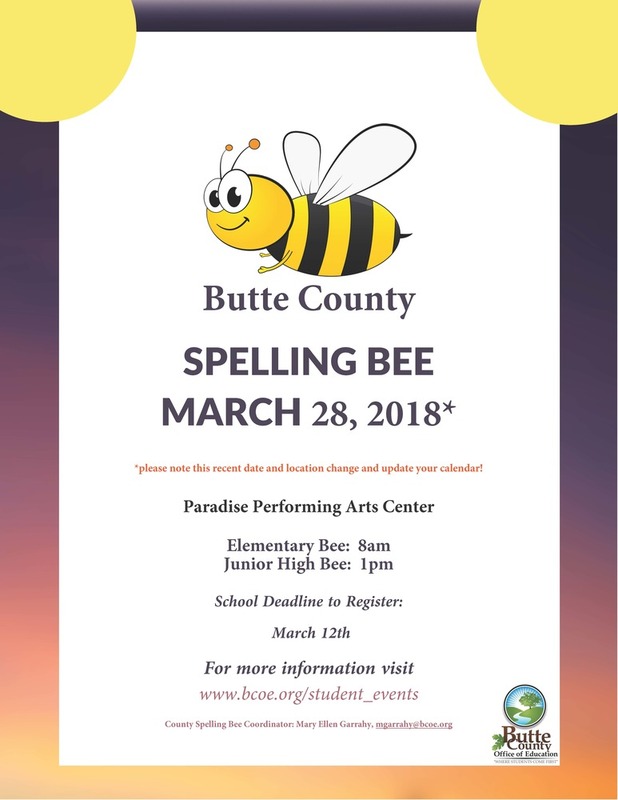 There are 84 students representing 43 Butte County Schools registered to participate. This is an oral Spelling Bee with two students advancing to the California State Spelling Bee Competition at the San Joaquin County Office of Education on May 12, 2018 in Stockton. There are 28 students representing 15 Butte County Schools registered to participate. This is a written Spelling Bee with two students advancing to the California State Spelling Bee Competition at Miller Creek School in San Rafael on May 5, 2018. Words for at least the first 2 rounds of the competition will be from the Practice List supplied to the participants and posted on our website. Words for the following rounds will be chosen randomly from many sources deemed appropriate for the competition. We are honored to have Butte County District Attorney Mike Ramsey as our SpellMaster. Thank you to Paradise Rotary Club for sponsoring this student event.